Gartner’s analysts David Norton and Mike Blechar recently published “Enterprise-Class Agile Development Defined“. Although the content is very light and the findings not revolutionary, the research presents a high level differentiation between enterprise wide Agile adoption and enterprise class Agile adoption. Our definition of EAD differentiates enterprise-class from enterprise-wide. Across the organization (enterprise-wide), organizations might be doing many self-contained/independent agile development projects that are totally unrelated and that meet specific tactical needs. Or, the projects may be first iterations of agile development projects intended to help organizations gain understanding and insight into how the application solution could subsequently be grown into a more complete solution, which will subsequently be integrated into the current application solution portfolio. Most of the agile development projects we see start out without real concern for the longer-term impact on the application ecosystem and broader solution architecture. They generally fail to scale to the needed enterprise-class solution characteristics we identify in this research, even though the project may consist of hundreds of developers and be classified as enterprise-wide. Enterprise-class AD includes assessing the impact on the current and future enterprise solution architecture for the organization to make the right business decisions. Agile development methods are increasingly being used within organizations as business differentiators, which is raising their profile from tactical project level to a more strategic enterprise level. Enterprise-class agile development cannot be driven only by the CIO and application development (AD) teams. Strong business commitment is essential. Don’t attempt to drive enterprise agile from an IT perspective, as it will fail. In their research, the authors have identified seven key elements that collectively, positively impact enterprise wide software development processes. Taken together, these key elements help organizations achieve an enterprise class Agile adoption. Customer-Centric: Exceeds the notion of the business project sponsor to include the corporate strategies and organizational goals. The product owner and team members need to fully understand and be aware of the impact of the solution and its architecture on the overall corporate goals. Collaborative and Cooperative: This is not just cooperation between IT and the business, but also within IT departments across the various sections of the organizations, including teams that are not co located. Constant Feedback: Though lengthy planning is often eliminated from Agile projects, due to organizational constraints it should not (and possibly cannot) be completely removed. This doesn’t mean to overly invest time and efforts but “just good enough” planning should allow projects to get started. As such, constant feedback isn’t limited to the communication between the IT and Business units but similarly with all support departments and various stakeholders. Heterogeneous Environment: There is no magic formula for success, and adaptation is required for a successful adoption. Throughout the Software Life Cycle: Agile practices, such as refactoring, applied throughout the life cycle, can extend the useful life of the application. Continuous Delivery: Speaks to the need of continuous collaboration between IT and the Business units in the development of a product. Adaptive Solutions: Discusses a compromise between a complete top-down architecture and an emerging architecture. A model allowing to lessen the impact of an Agile transition. PATH is an acronym for Process-Added value-Technologies-Human, the 4 dimensions of software development. 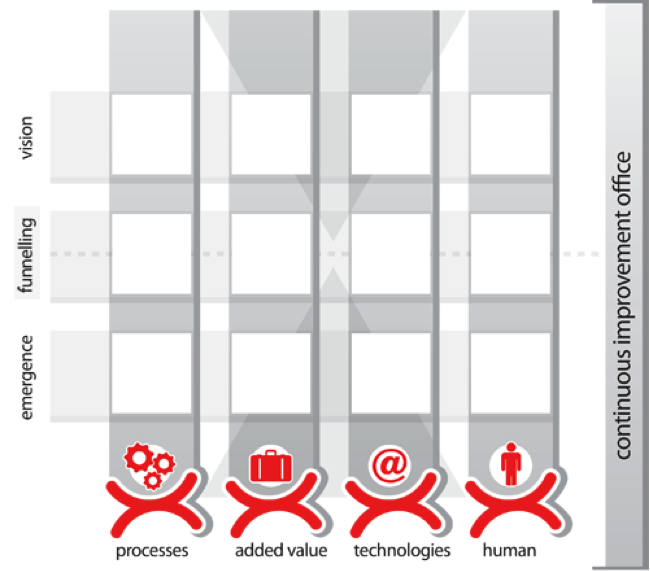 Processes: Efficiently deliver value with a simple process adapted to the project’s needs (lowest cost within time). Added value: Deliver functionalities and maximize their business value (prioritization and flexibility). Technologies: Deliver quickly and consistently with appropriate engineering practices (sustainable pace and skills development). Human: Deliver at a sustainable pace and in harmony while promoting team work (collaboration and communication). In addition to the dimensions, the PATH model introduces 3 influence levels—vision, funnelling and emergence—that, when applied to all 4 dimensions, produces 12 intervention areas. The ‘Vision’ level shows the orientation to meet established objectives. This level is generally linked to the strategic vision of the organization. The vision represents the objectives to achieve. The main objective of the ‘Funnelling’ level is to implement mechanisms promoting collaboration (e.g. communities of practice, wikis, and blogs). Therefore, funnelling allows the emergence of the best practices arising from development teams as well as the dissemination of these practices to all groups that may benefit from them. Therefore, the ‘Funnelling’ level acts as an information catalyst and aggregate. 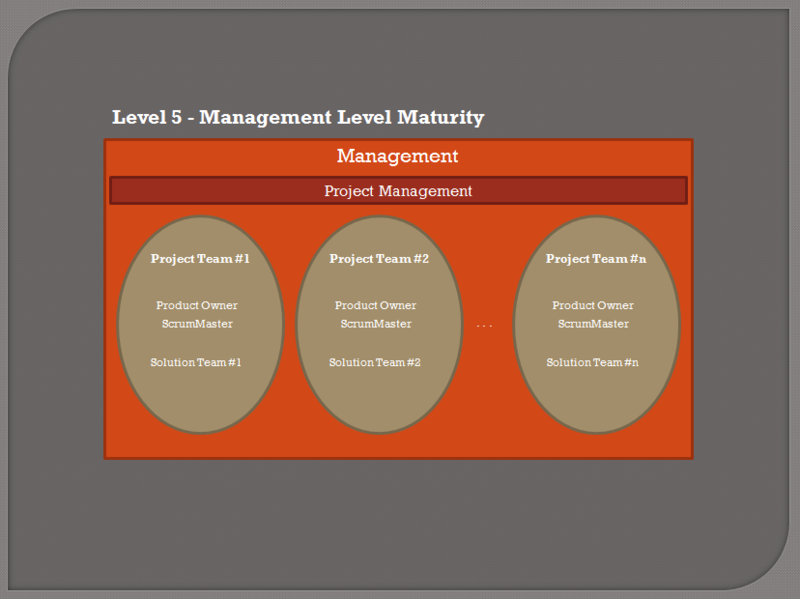 The ‘Emergence’ level is the level for project teams developing software solutions. It is important to implement new development processes and train team members on how to apply Agile principles. After giving this introduction training to over a hundred people managers, I have decided to make the presentation material available to the general public in an attempt to help organizations successfully transition to Agile. This presentation is introductory level as it introduces some of the most common reasons why organizations choose to adopt Agile approaches. It presents some high level statistics on software development project success (and failure) to demonstrate why the traditional project management approach may not always be the best approach to successfully deliver projects. 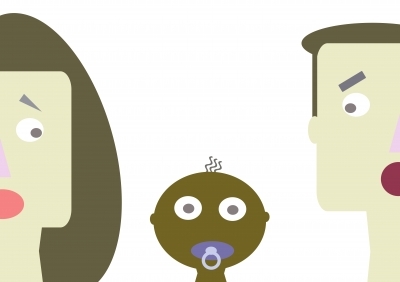 The presentation introduces what Agile is (and isn’t) and the reasons justifying its adoption. Once the Agile concepts have been presented, the material introduces the Scrum approach by giving a walk through of a typical process. The presentation ends with the main impacts on people managers within organizations who are adopting Agile. I hope you will find the presentation useful to help you move your transition in the right direction. Feel free to circulate the material. View more presentations from Martin Proulx. Benefits associated with an Agile Transition – What can Scrum do for you? Ability to “test” the feasibility before fully developing the solution. These are only a handful of benefits. What benefits have your team witnessed since starting Scrum? I sat with one of our customer last week to review the 2011 budget for their Agile initiative. The client had a good start in 2010 with 10 pilot projects adopting Scrum. Not a small accomplishment considering their objective of transitioning over 3,000 people to Agile. The client shared with me that in addition to highlighting potential issues around their projects and increasing the teams’ performance, Scrum helped many of these teams substantially increase employee satisfaction – which is an important factor for employee retention within that organization. During the meeting, the client explained that now that they had experience with 10 pilot projects, they no longer needed help coaching other project teams in the organization. They recognized the benefits of working with coaches to quickly develop the rights skills and abilities but they could now do it all by themselves. Let me state it clearly, I believe the end goal of external consultants is to ensure their client can become fully independent and autonomous. That being said and before I go on with this post I need to say (to be truly candid and transparent) that I have told the client – in person – what you are about to read. The client’s objective is to successfully complete over 20 Agile projects in 2011 and then 200 in 2012. 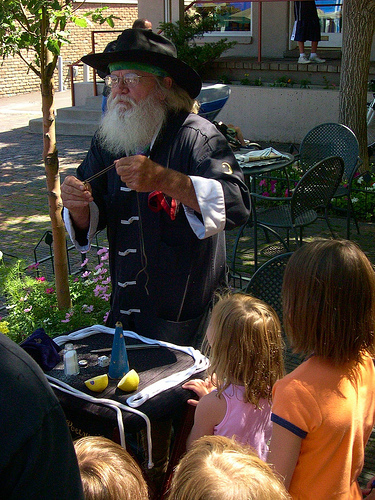 In itself, that sounds like an aggressive but feasible plan but here the catch: the client believes in magic! Magic? You be the judge. The client explained that they had to cut back on the budget for the coming year – which I fully understand – but despite the set back, they were continuing their organizational wide Agile transition. “We have everything we need”, they said. “We expect each project team to go out and get the help they need to transition to Agile” – Why not help them?. “Are you involving the teams and people who will be impacted?”, I asked. “No need”, they answered. “They only need to execute on the plan we will give them”. During our monthly consulting services meeting, an interesting conversation took place. The conversation revolved around how to show traditional organizations the benefits of going Agile. Granted, everyone around the table was already sold to Agile so everybody was working toward the same objective. The question was how to bring traditional organizations to switch their ways of doing things in order to adopt a more Agile approach? The debate was “Should we use a big-bang approach where all the energy is put toward getting the organization to take a quantum leap?” or “Is it preferable to use small steps in an effort to bring the organization toward the desired state?”. Some people around the table argued that to quickly gain acceptance and shock the system, it is better to take somewhat of an extreme position and avoid deviating from the goal and as such, implement the Agile practices without consideration to the context. Others (including myself) believed that the hard position and extreme approach doesn’t help much. It typically polarizes positions and creates an environment where conflicts are frequent. Personally, I believe that small steps taken in the right direction are much better than attempting to quantum leap forward when it comes to large scale transitions. As consultants we are called in to help organizations transition from a current state to a future and hopefully better future. We bring our expertise and our convictions to the table in the hopes that we can influence these organizations. What happens when the consultants’ perspective collides with the organizational culture, values, processes and people? Of course, it depends. I will be successful for as long as I can hold my position. We will be successful for as long as we can hold our position. What comes next is an organization that will be less (and less) adapted to its environment and a Darwinian (survival of the fittest) consequence will happen. 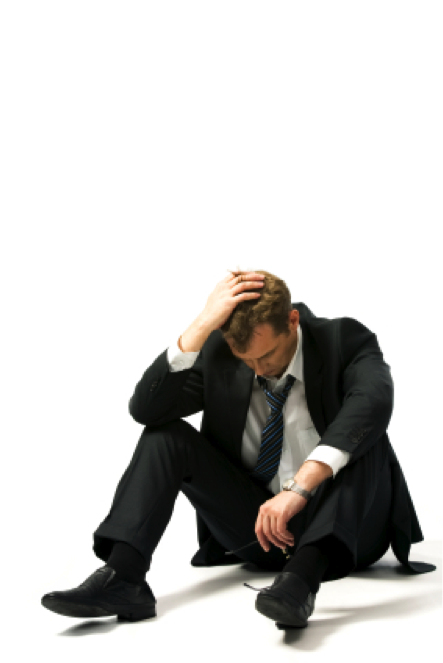 If you are a consultant, it is always a difficult balance between sticking to your position and completely letting go. The answer obviously varies by organization but sticking to a hard position is rarely (i.e. never) a good approach to actually change an organization. But let’s face it, people like to know where they stand compared to others. Starting at a very young age, we have been raised and trained to compare our results to others in an attempt to reach the next level – whatever the next level may be. Are my grades better than Tommy’s? Can I run faster than Carl? Am I stronger than black belt Anna? Did I earn more frequent flyer miles than Frank? It’s the same thing with Agile. People – managers and executives mostly – really have the need to know they are headed for the top of the maturity model. It may not make much sense but they have been raised and trained to measure, to compare, and to brag when comparing favorably or to adapt when comparison isn’t positive for them. As I already stated, I agree with Esther when she says that it doesn’t really matter how Agile you are. What matters are the results. So along those lines, I believe it is important to associate the level of maturity and the related results which I believe exist and can be demonstrated. Unfortunately, there isn’t much hard data to demonstrate that achieving a certain level of maturity provides x% of improved performance or y% cost reductions but most of us who have been implementing Agile within organizations would agree that that higher the maturity, the better the results. So it is based on these observations that I decided to present yet another Agile Maturity Model. As recently reported by Forrester, Scrum being the most adopted Agile approach these days, the proposed maturity model heavily relies on the adoption of Scrum practices with a lesser consideration to other practices such as: Agile Modeling, Feature-driven development – FDD, Test-driven development – TDD, eXtreme Programming – XP, etc. By no mean I am rejecting or considering those other approaches non-important. I built this model mostly on Scrum because this is the comparison organizations are asking us to be evaluated on at this time. At this level, team members have decided to adopt Scrum and/or software engineering practices without asking for approval from their manager. Some of the well known practices are used but without consistency. At this level, the practices adopted by the team members have started to be imitated by other teams within the software development department. Some of the managers have noticed the positive results of adopting the Agile approach and are tempted to replicate what they observed. At this level, the solution teams have integrated the business people in the model. Collaboration (and trust) has increased and a partnership relationship is increasing. 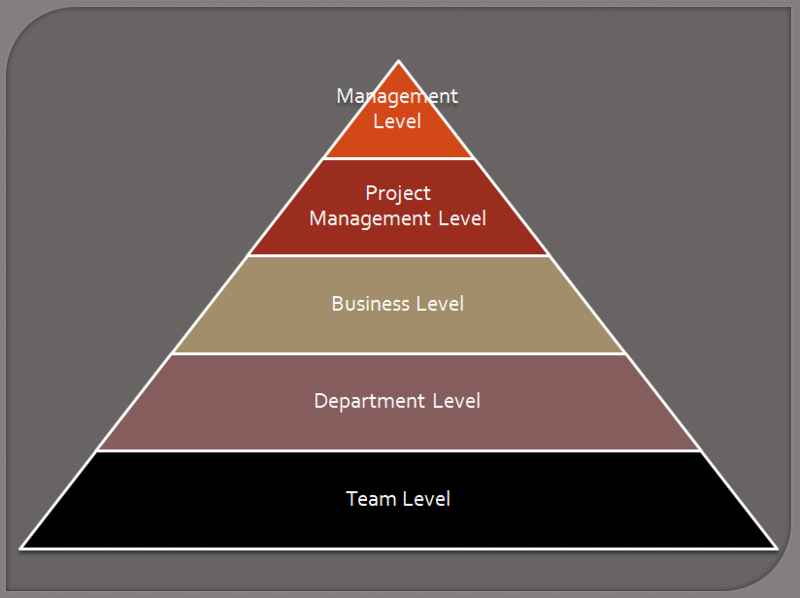 At this level, the project management approach is modified to include some of the Scrum practices. Although the department still mostly relies on the traditional PMBOK recommendations, Scrum has been integrated in the project management approach. At this level, managers have adapted their management style to support an Agile organization. Organizational structures and reporting mechanisms are better adapted for collaboration and improved for increased performance. Utopia or the nirvana? At this level, the entire organization – the people, the processes and the tools are aligned with the Agile principles and values. As I haven’t had the opportunity to witness such an organization (yet), I am unable to describe the criteria to be used to qualify for this level. The Agile Maturity Model (AMM) posted on April 1, 2010. 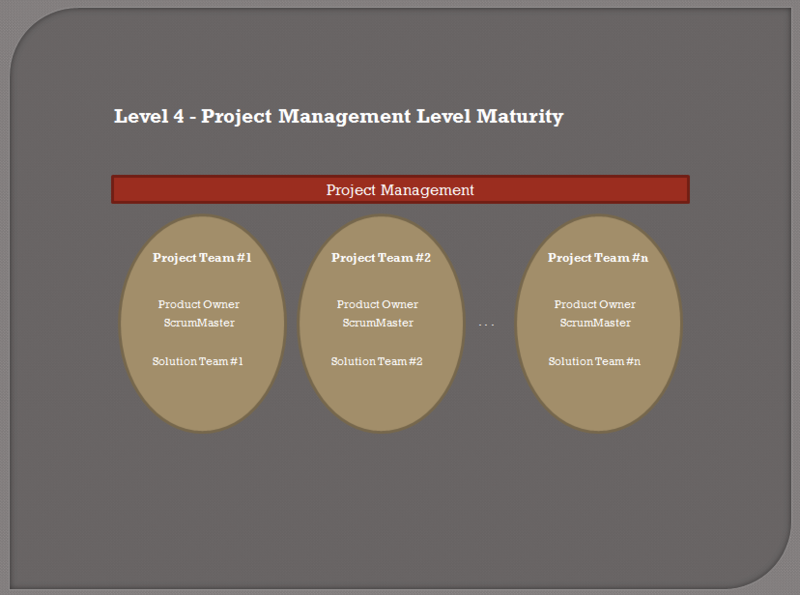 Does Agile Need Its Own Process Maturity Model? posted on June 1, 2009. Scott Ambler Revisits Agile Process Maturity Models posted on April 27, 2009. Agile CMMI: Complimentary or Oxymoronic? posted on December 19, 2008. The Agile Maturity Model posted on August 2, 2008. 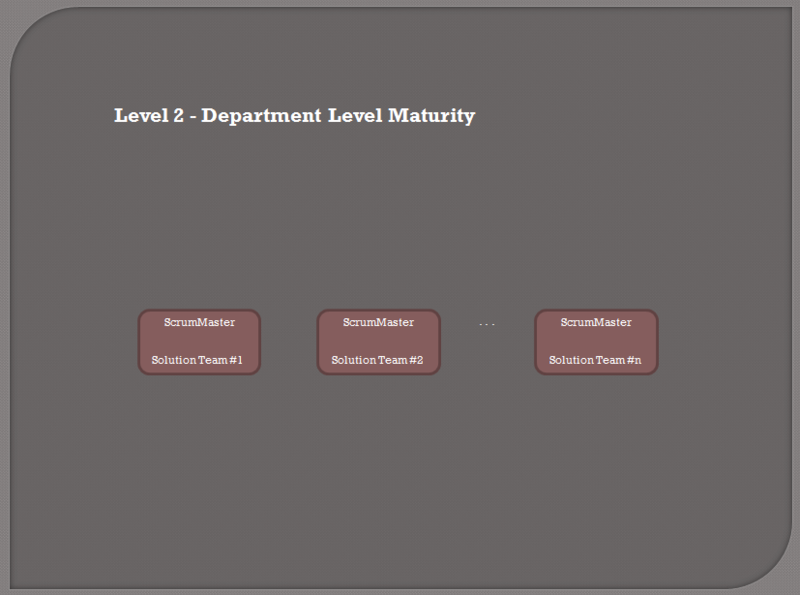 Does the Agile Community Need a Maturity Model? posted on October 16, 2007. 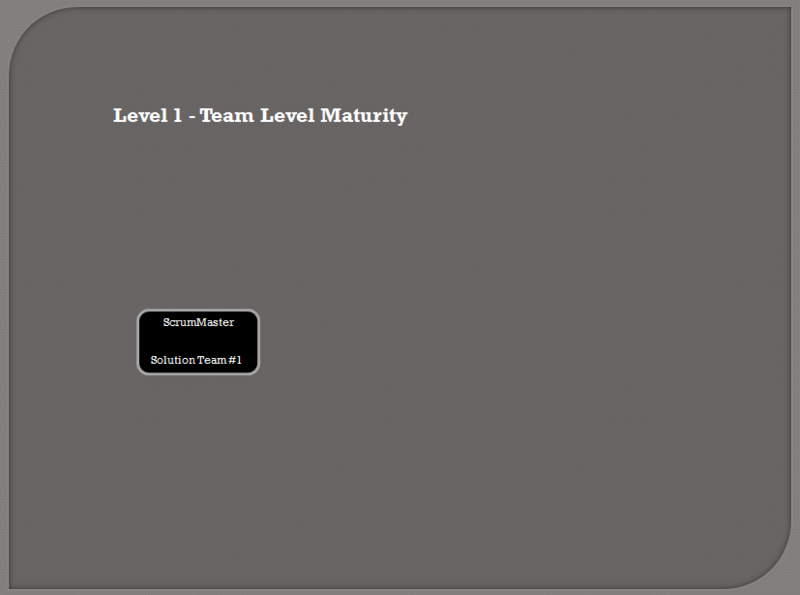 An “Agile Maturity Model? posted on June 7, 2006. Agile Transition – What about the teams outside the transition? In a large scale transition similar to the one we have undertaken a few months ago, it is difficult (and maybe impossible) to transition all the teams / departments at once. Similar to the prioritization of the product backlog, we have selected a handful of projects to launch immediately. Unfortunately, this means that many (many more) projects will not begin their transition for a while since the organization we work with has decided that coaches are required to help them succeed. As such, we have decided to implement a strategy for those “out of transition” teams. Below is the approach we selected in order to make the transition successful without negatively impacting the performance (and the workload) of those directly involved in the transition. Based on our experience, we felt it was important to have a strategy (albeit minimal) to support other projects to be implemented using an Agile approach. For other projects to be executed successfully in an Agile mode even if they are not part of the intial selection. Access to the corporate wiki for information, knowledge sharing and best practices. So far, the recommendation has been well received by the “out of transition” projects. In the months to come, we will be able to determine if we made the right decision.